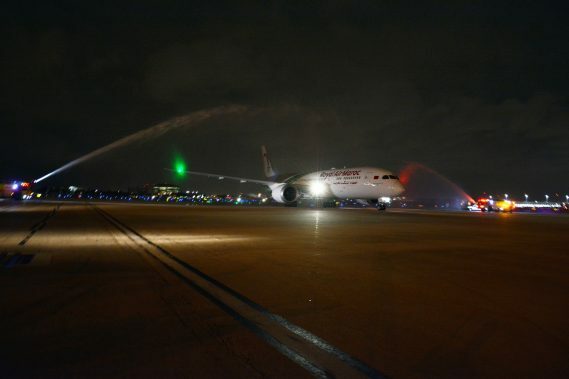 MIA welcomes Royal Air Maroc with a water cannon salute. 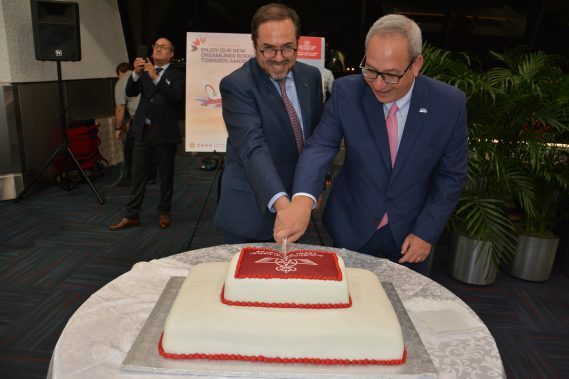 Moroccan national carrier Royal Air Maroc (RAM) launched the first-ever Miami-Casablanca route on April 3, giving Miami International Airport its first passenger flights to Africa since the year 2000 and Florida’s only nonstop service to the continent. RAM CEO Abdelhamid Addou and MIA Director and CEO Lester Sola cut the cake. The inaugural Miami departure was celebrated with a ribbon-cutting ceremony and gate reception, which was attended by: Her Highness Princess Lalla Joumala, Ambassador of the Kingdom of Morocco to the U.S.; Mayor Gimenez; Miami-Dade County Commission Chairwoman Audrey M. Edmonson; County Commissioner Jean Monestime; MIA Director and CEO Lester Sola; RAM CEO Abdelhamid Addou; and U.S. Consul General in Casablanca Jennifer Rasamimanana. Attendees and passengers were treated to traditional Moroccan refreshments and entertainment. RAM’s new service provides three weekly roundtrip flights between Miami and its Casablanca hub, where it offers dozens of connections to North African, West African and Middle Eastern destinations. The route is served with new-generation Boeing 787-8 Dreamliner aircraft configured to accommodate 18 business class and 255 economy class passengers. The Royal Air Maroc National Company, born in June 1957 following the merger of Air Atlas and Air Maroc, is Morocco’s largest airline. With a fleet of 55 aircraft and more than 90 destinations with regular frequencies, RAM connects Morocco to five continents. The airline is one of only 42 in the world certified as a 4-Star Airline by international air transport rating organization SKYTRAX.